This work provides a comprehensive look at the latest developments in lease financing. 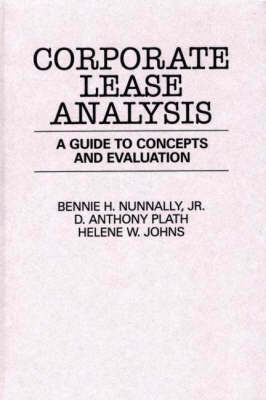 Rather than offering an exposition of leasing theory, Nunnally, Plath, and Johns present the application of this theory to actual business situations. The various types of leases are clearly delineated, including their advantages, disadvantages, and appropriate use. In emphasizing decision-making techniques, the authors incorporate into the volume the tax implications of leasing, the lease versus buy material, and the major contributions of academic research in leasing, with an explanation of how the research both increases the use value of leasing and applies to actual financing problems. The volume is written in a clear, readable style and is divided into five subject areas: leasing concepts, analytical foundations of leasing, reporting for leases, evaluating lease transactions, and the role of leasing in modern financial management. The authors begin the book with a description of the types of leases and their tax, cash flow, and profit implications. A full chapter focuses on the fundamental techniques of time value of money and capital budgeting, which underlie lease analysis; these techniques are subsequently used to illustrate basic principles of lease valuation. Simple numerical examples introduce different lease valuation methods, and explain how to calculate rate of return and identify the appropriate rate of discount. Several contract provisions that complicate lease valuation problems are discussed, including variable rate lease payments, leveraged lease arrangements, and sale-and-leaseback transactions. The work concludes with a survey of contemporary leasing practices and costs. This study will be an important asset for all types of financial managers, as well as for students in finance and accounting courses and for both public and academic libraries.